What a delightful dinner! I’m still blown away by the layers of flavor and character of this meal. Wow!!! Necessity is the mother of invention, so they say. This is one of those meals that just came about. We were trying to figure out what we wanted for dinner with no real idea about what we wanted or felt like cooking. This typically entails going and looking at what is in the fridge and freezer. Then, standing in the pantry and staring at the various spices, condiments and whatnots we have available. Going back the fridge or freezer and selecting some protein to cook and back to the pantry again. Typically, once I start pulling things out Baby Lady will ask me what I’m fixing. At this point there is further discourse abut the meal and she gives me her thoughts and suggestions. The plan then forms and begins to take shape. In this instance, we had some chicken thighs in the freezer. We typically buy thighs because they are perfect for 2 people and we prefer the thighs anyway. 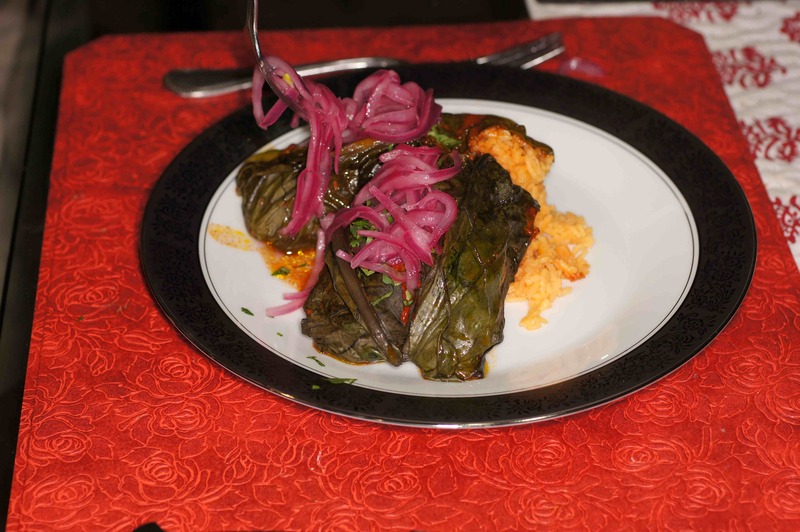 We also still had some achiote paste our friend, Adriana, brought us from Mexico D.F., some leftover mojo de ajo in the fridge and beautiful fresh swiss chard in the garden. 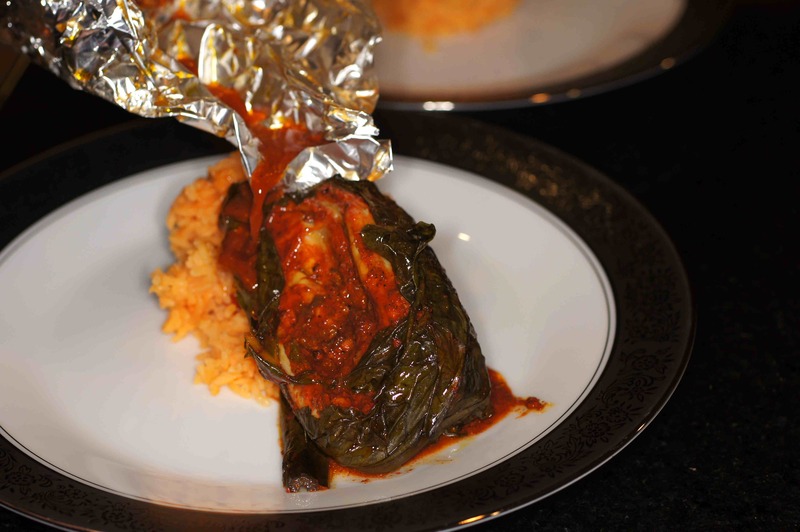 This was going to be a spin on the Cochinita Pibil (Achiote Slow Roasted Pork Shoulder Wrapped in Banana Leaf) we made previously. 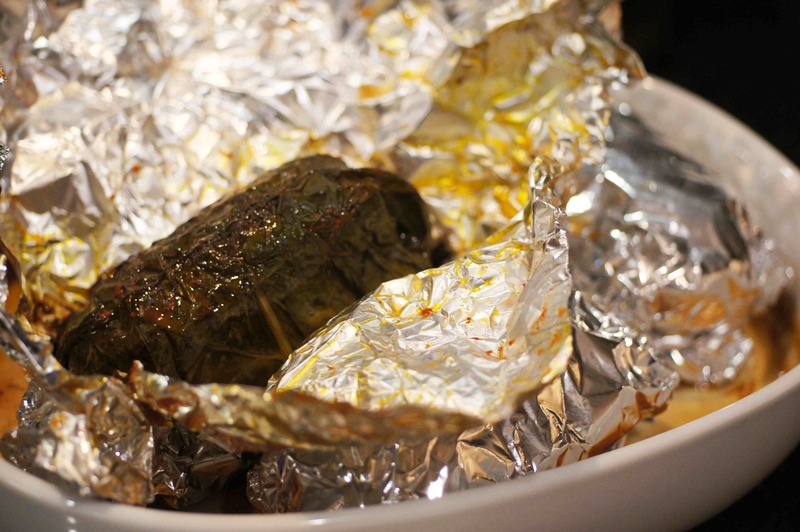 Instead of banana leaves, we were using the edible swiss chard, wrapping the delicious little packets in foil and baking them in the oven. We also wanted to use a little orange juice with the lime juice in the paste. The final product was absolutely delicious and loaded with flavor. We will definitely do this again sometime and this is what we did. 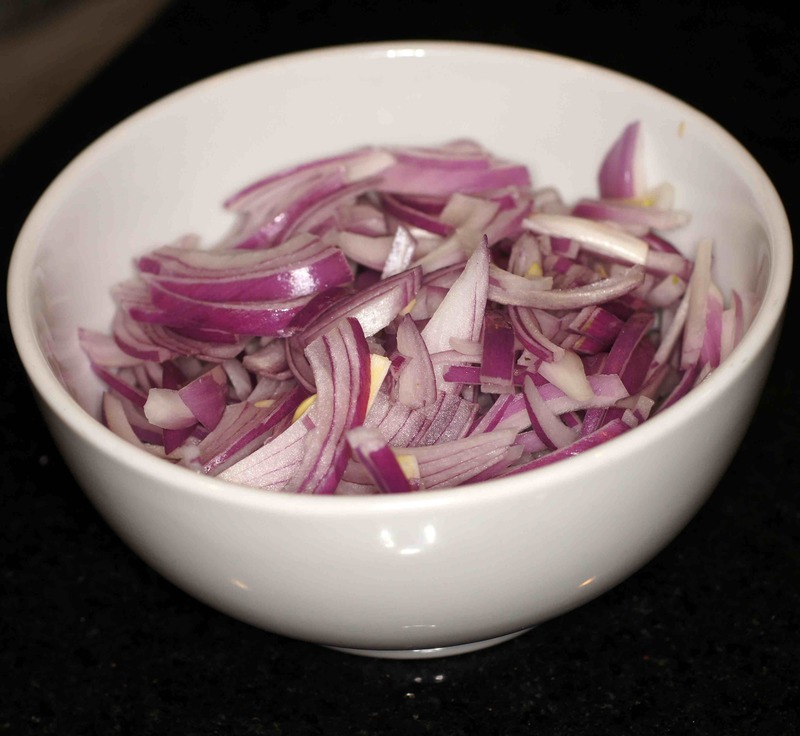 First thing first, while preheating the oven, make the pickled red onions. These are super simple but so good. 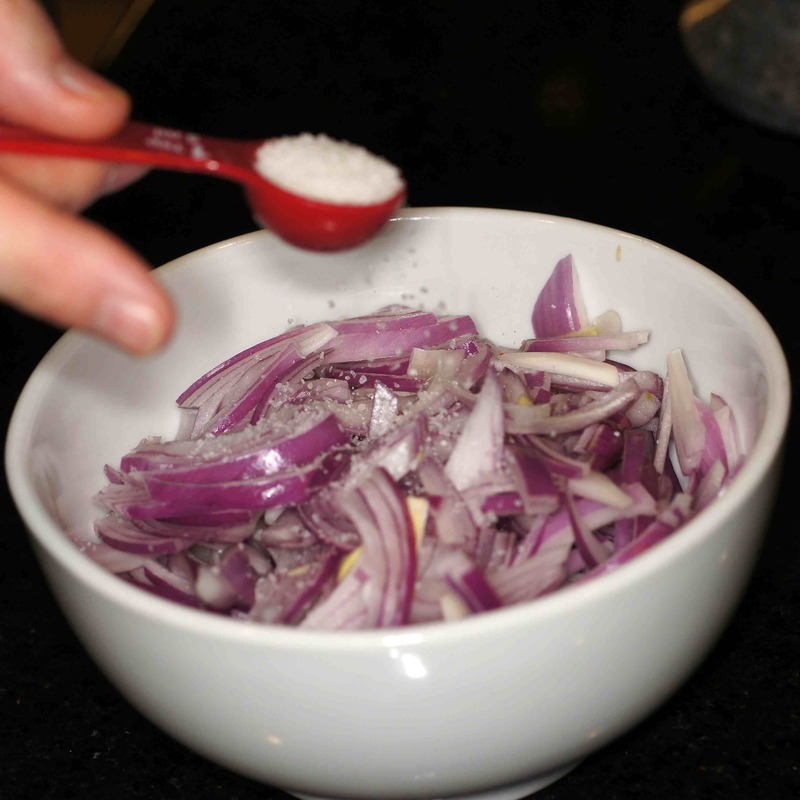 Start by putting the sliced red onions into a bowl. 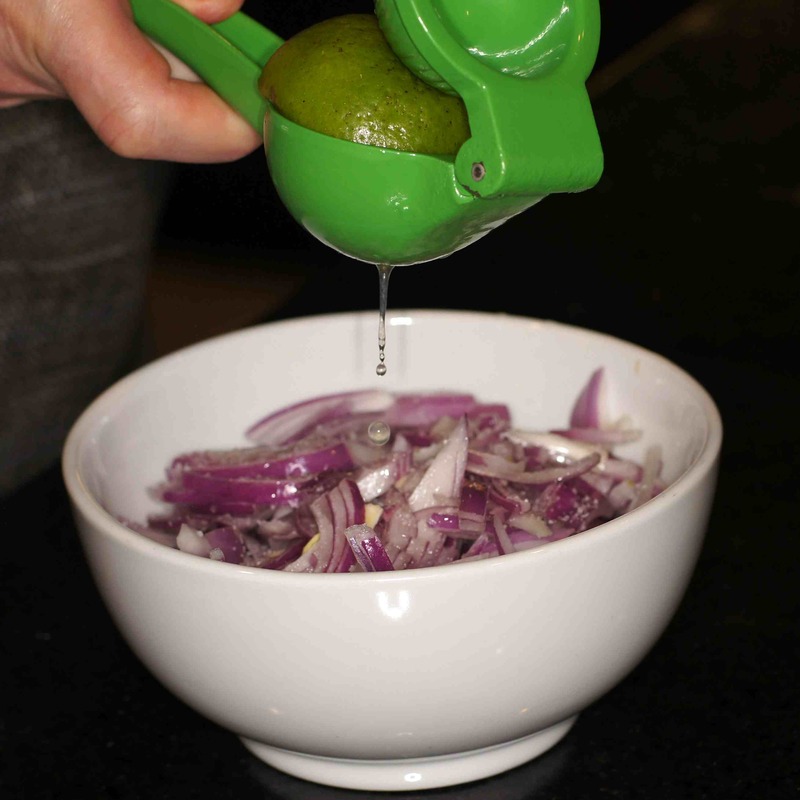 Now add the juice of 1-1/2 lime. Set aside and stir occasionally while the rest of the meal is cooking. 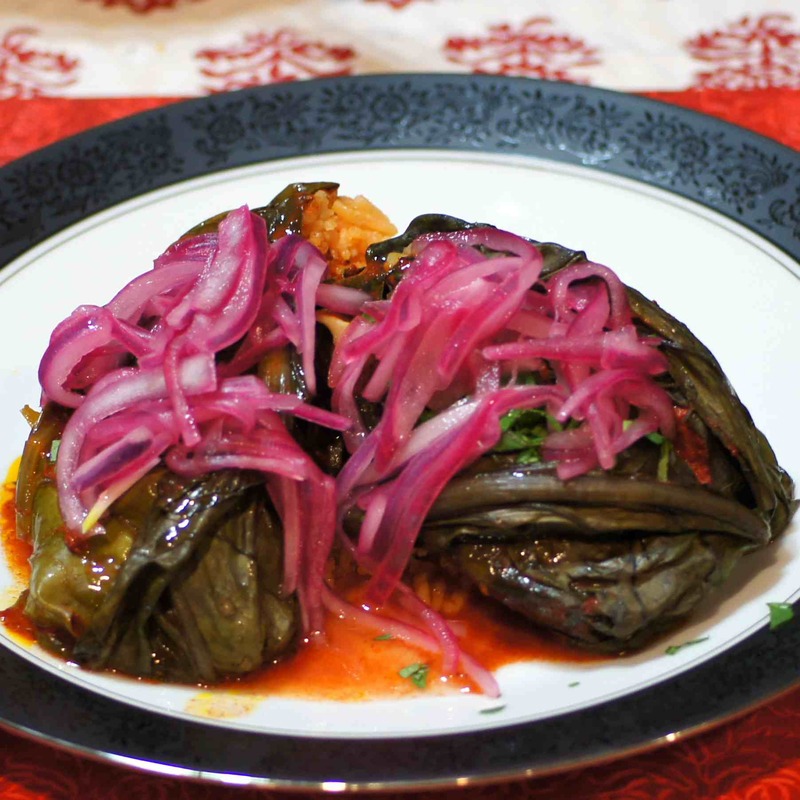 These pickled red onions are fantabulous! 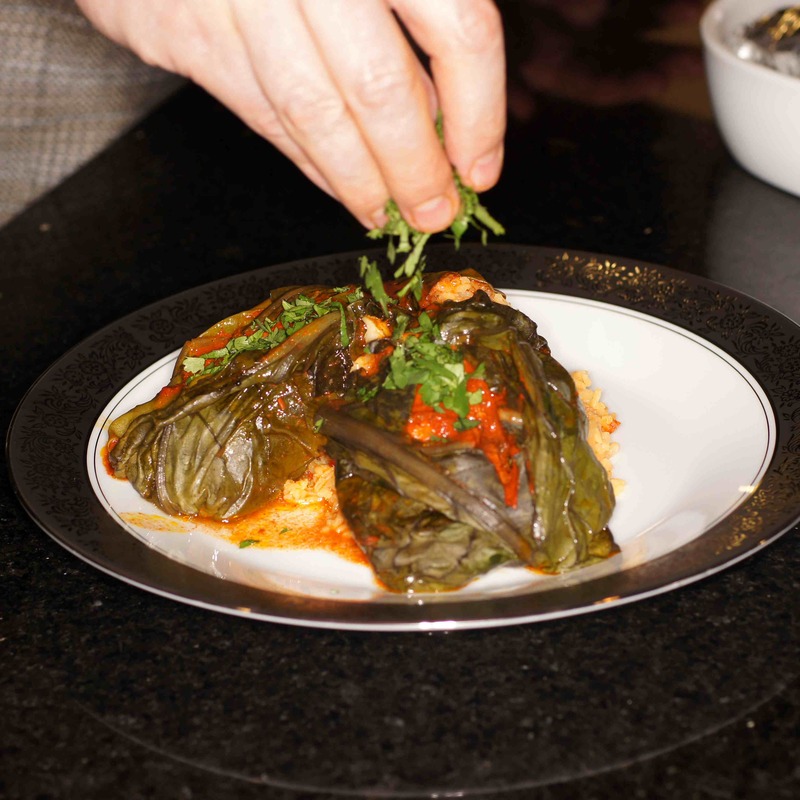 We love to have these on hand as they go with so many dishes. Next, assemble the achiote mojo de ajo paste. 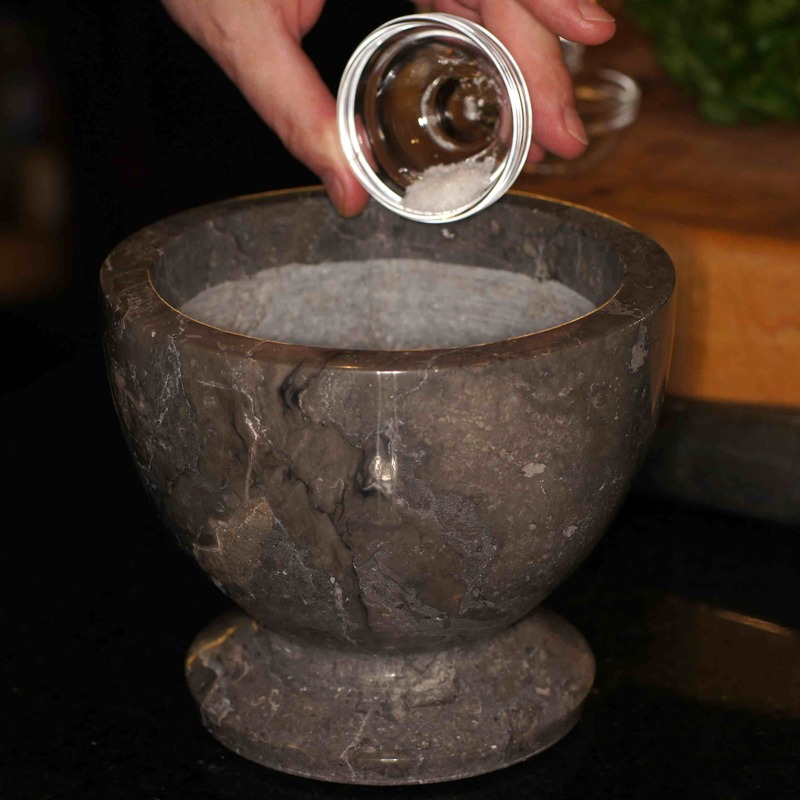 Start by pouring the mojo de ajo into a mortar. 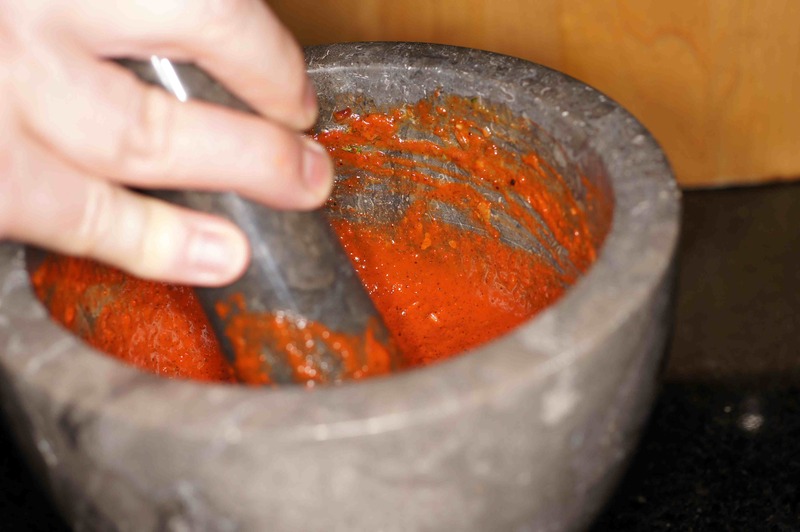 Pound the spices achiote paste and mojo de ajo until you have a smooth, thick paste. 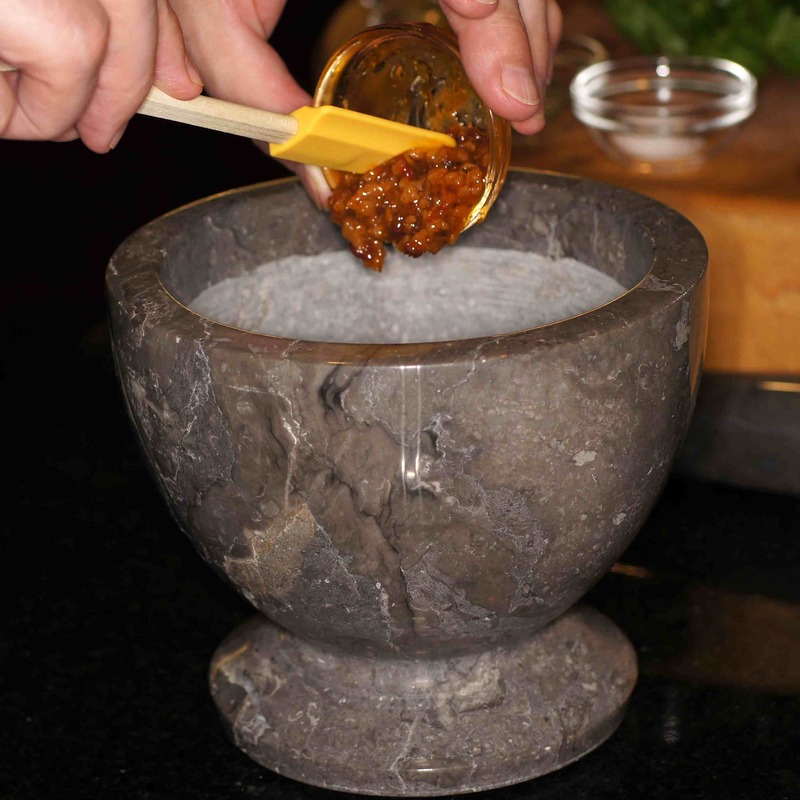 Again, using the pestle, pound and stir to incorporate the juices and make a smooth, thinner paste. 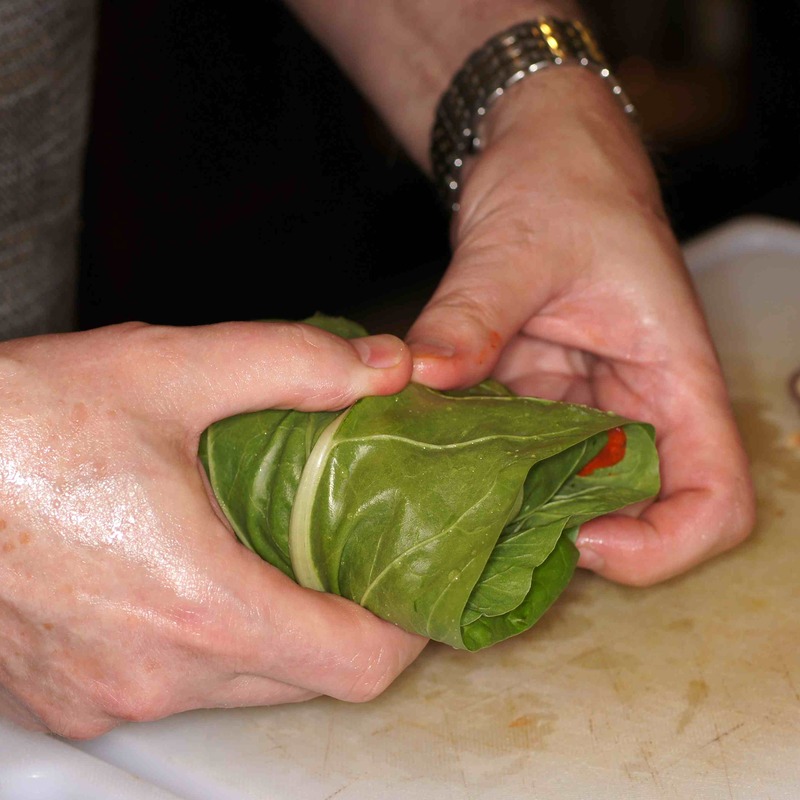 Get a swiss chard leaf and lay a thicken thigh on top of the leaf. 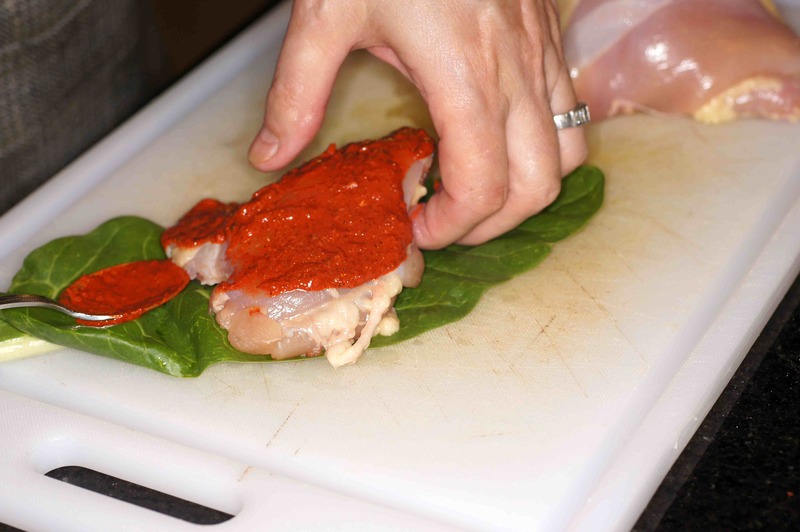 Slather the chicken thigh with the paste. Now, slather the other side. 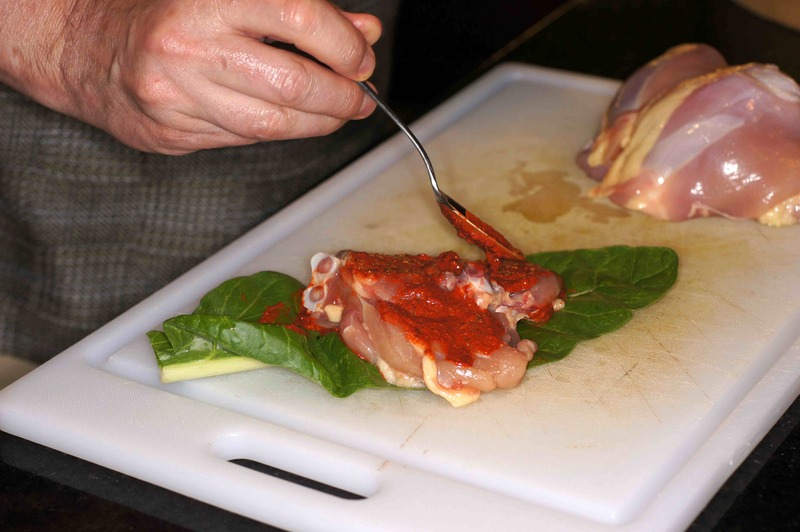 Roll the chicken thigh in the swiss card leaf. 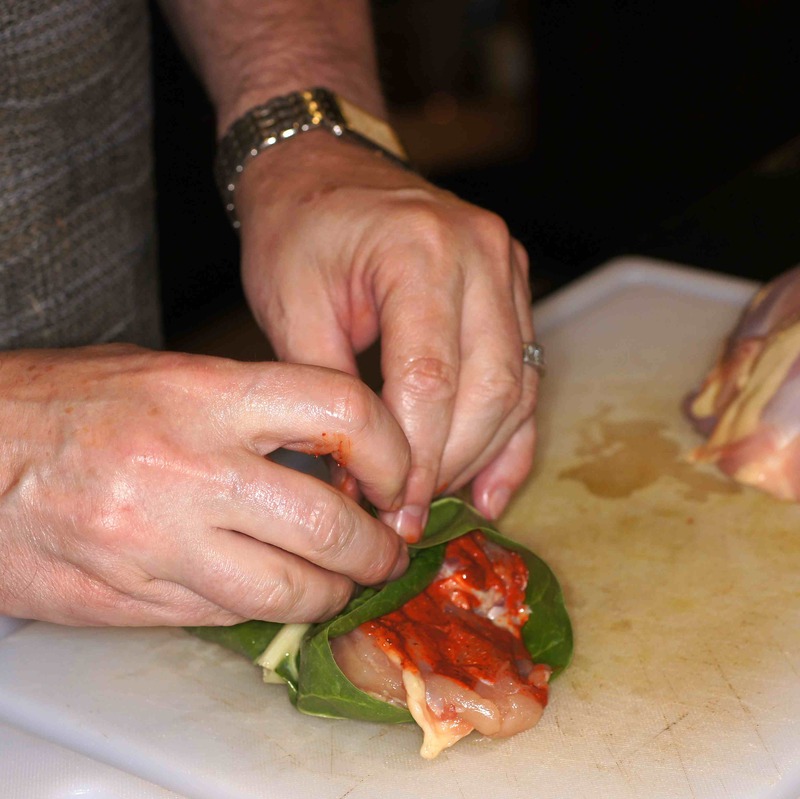 Get two swiss chard leaves and wrap chicken thigh again but this time crosswise to form a packet. Now wrap in foil and tightly seal. Repeat the process with the other 3 chicken thighs. Place in a small baking dish and into the oven they go. Bake for approximately 50 – 60 minutes. 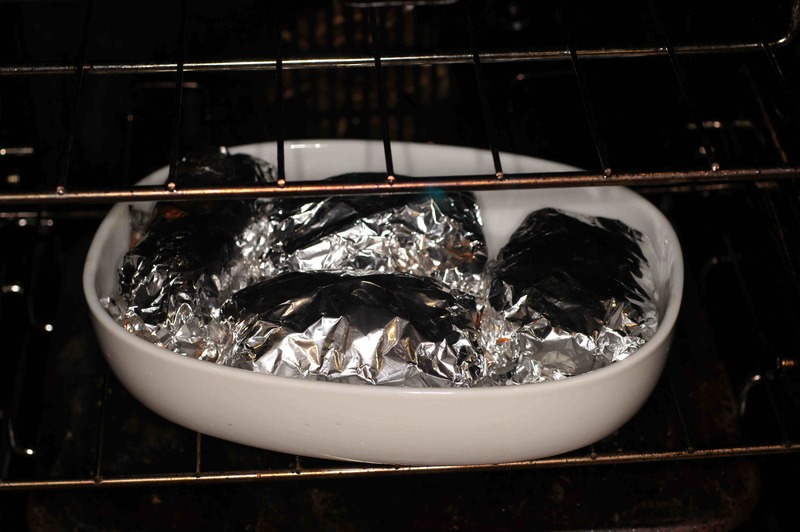 Remove from oven and open foil packets. 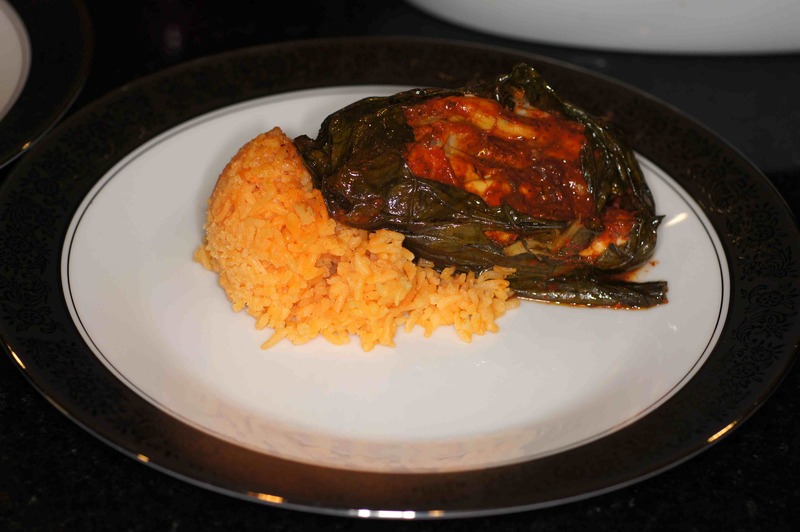 Put a spoon of Spanish rice in the middle of the plate and place a swiss chard packet on top and open the swiss chard. 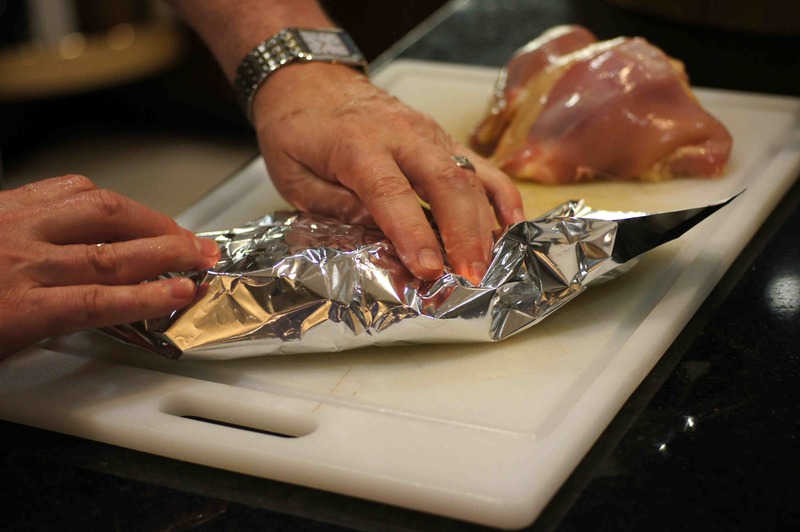 Pour juices in foil over packet. Repeat the process for the second chicken thigh. Sprinkle with cilantro. Have read thru’ this twice: oh yes, I’ll enjoy for sure! Great when someone’s imagination is fertile enough to make something pretty much different from what one has seen before !! Methinks this just will have to be shared with friends 🙂 ! Thanks for the very nice compliment, Eha, and the share with your friends, 🙂 There is great flavor in this dish and it is perfect for 2 people. Actually have had some very nice comments back, especially by people knowledgeable about achiote et al . 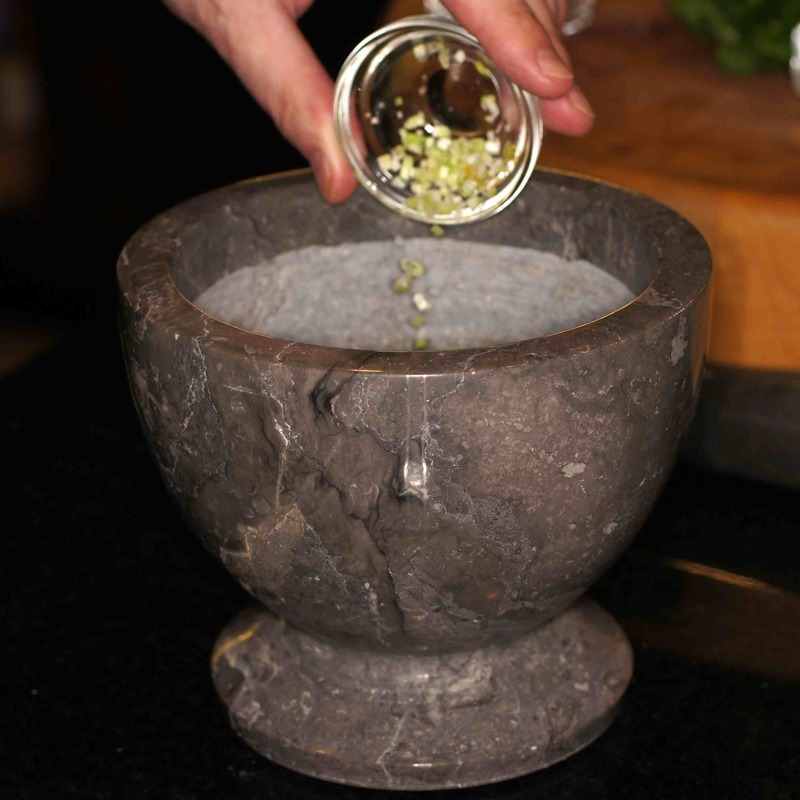 . . Forgot to say I quite envied you your beautiful mortar and pestle . . .
Eha, you are very kind. 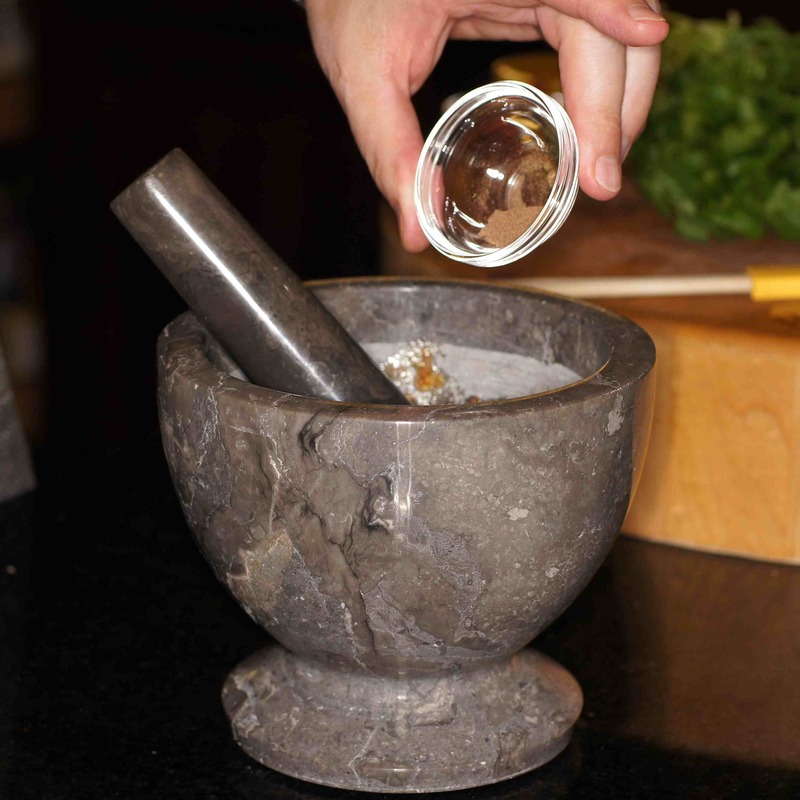 I love mortar and pestles and have a smaller version (almost identical) of the one in this recipe. Ironically, I purchased them in different locales many years apart. 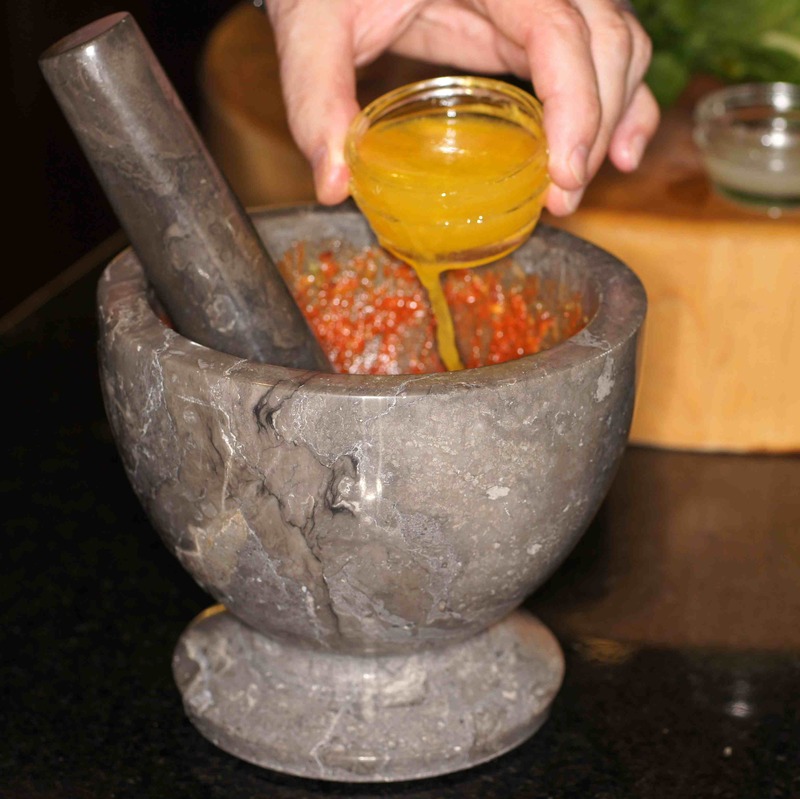 My love of mortar and pestle goes back to when I was a small child and one of my Dad’s close friends was a pharmacist. 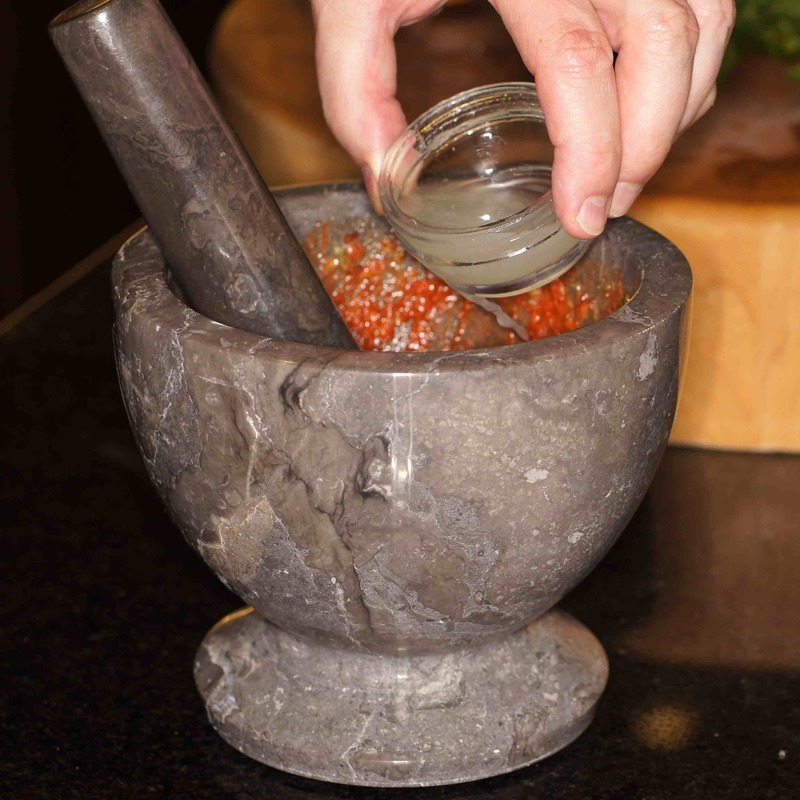 Back in the day they actually used a mortar and pestle to make certain things although I have no idea what they were. I always got a kick out of watching him crush things and mix them together in his mortar and pestle. His Rx sign out front had a mortar and pestle on it. I became fascinated by them then and was somewhat surprised when I found out years later that they had culinary applications. 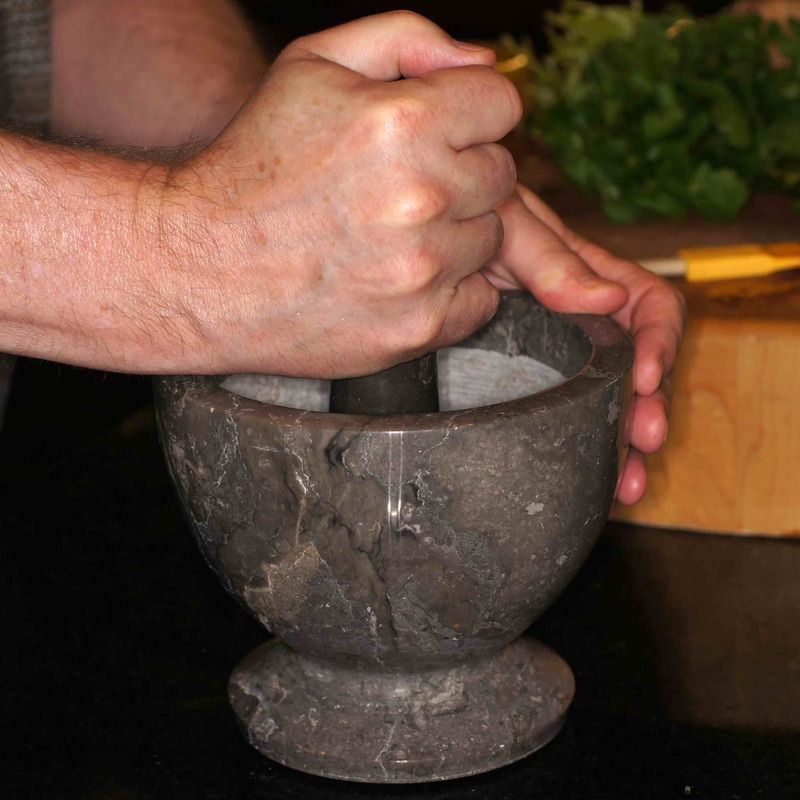 I love the beauty of wooden mortar and pestles but for practical purposes they are worthless. I love my molcajete and for certain things (i.e. annatto seeds themselves) it is the best but it is a little to porous and coarse for most things and is a bear to clean. 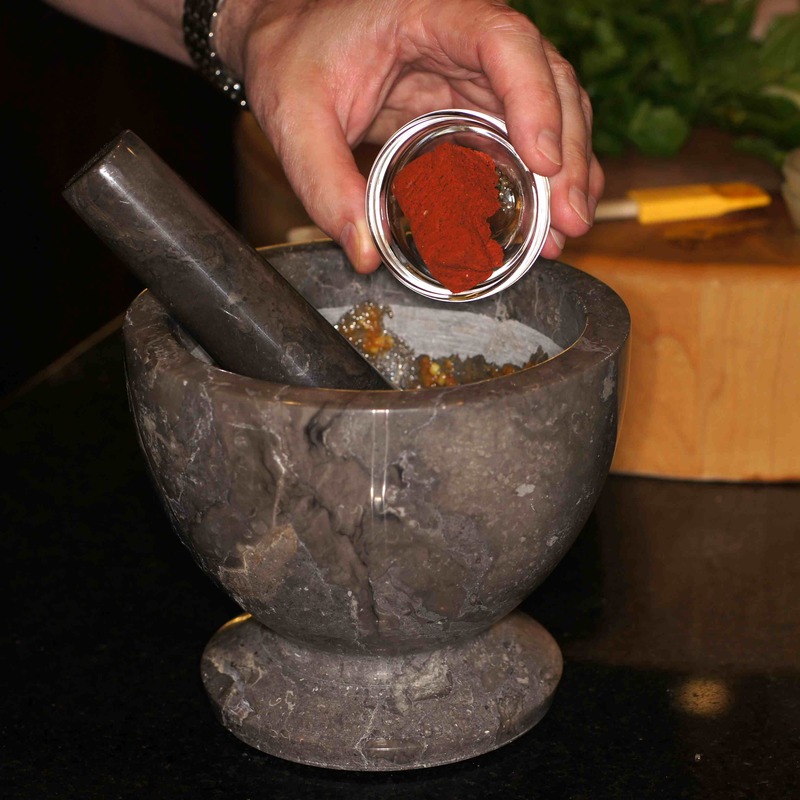 For herbs & spices I like roughened granite/marble best. 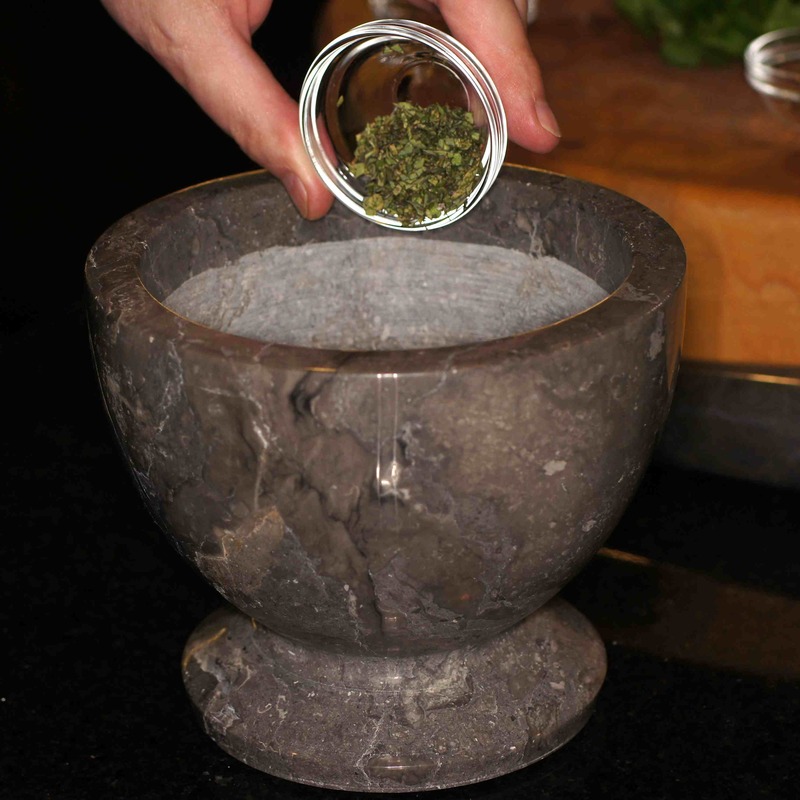 It does a great job of crushing and grinding without a loss of herbs/seeds/spices flying all over the place and is easier to clean. 🙂 At least, that has been my experience. Thanks! When I was a tiny tot in Estonia I actually remember a mortar and pestle still being used at our main town pharmacy 🙂 ! What a gorgeous colour on that paste! So vibrant in colour and flavour too. 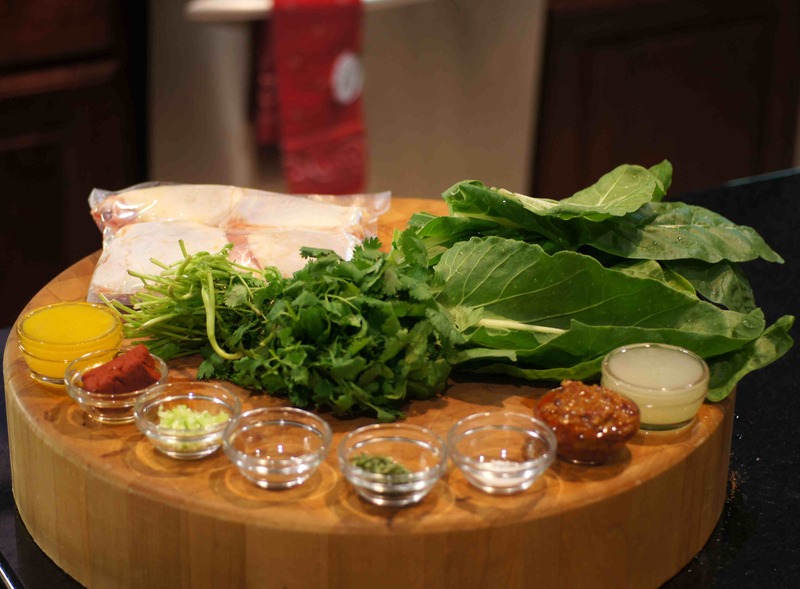 Love all the components of your dish, yummy! Hi, Nazneen. Thanks for dropping by and your nice compliment. 🙂 This is a wonderful dish but I am curious how you came from London to Houston, Tx to now living in Broomfield, Colorado. Talk about culture shock! I look forward to reading your blog and learning about the transition. With your Indian heritage and world travels, I would also imagine you have a very unique culinary approach and palette with which to paint. Excellent walkthrough Richard. It looks very tasty. I’ll bet Baby Lady is very proud of that ‘lime juice in mid air’ shot. I am working on some posts featuring your chiles. So far, I have a beef chili with cornbread, beef short ribs with ancho rub and wild salmon with ancho rub. We also did a lamb shoulder test, pitting two marinades against each other. One was 3 chili and honey. The thing I don’t have at present is time to write them up. Bring on the holidays…. Oh wow, this totally surprised me! I was skeptical by the title, but once I saw how this came all together with the various ingredients my mouth was watering. I too am a “seat of the pants” cook, and my family would starve if we ever relied on having a specific recipe to follow every night. Well done! Hi Richard, I made something inspired by this tonight. It was good, but even though I used only 1 Tbsp of achiote paste it still tasted far more of achiote paste than of the mojo de ajo. Perhaps because I cooked it sous-vide? I think I may try cooking chicken with just the mojo and leave out the achiote altogether, as I don’t care for the flavor very much. The color is extraordinary though.